These transformers offer not only extended low-frequency and Bessel-tailored high-frequency responses, resulting in ultra-low time-domain distortion (DLP), but use Jensen-pioneered multiple Faraday shields for unmatched immunity to hum, buzz, and RF interference. These noise problems can plague systems where distances between signal destinations is large and abnormally high ground-voltage-differences are the norm. Because they are manufactured on computer-controlled equipment, unit-to-unit consistency is extremely tight. All are enclosed in MuMETAL® magnetic shielding cans to reduce hum caused by nearby magnetic fields and insertion losses are minimal. 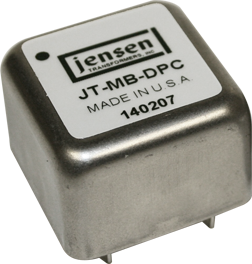 Jensen manufactures Microphone Splitter Transformers in models with either 1, 2 or 3 secondary windings for 2, 3 or 4 way microphone splits. All Jensen Microphone Splitters have a 30dB Magnetic Shield can and Multiple Faraday Shields for ground isolation far superior to competitive units.